I’ve been rather quiet of late writing my blog due mainly to the arrival of our littlest Rolt, Ellie. She turned 12 weeks old this weekend, and whilst 12 weeks in some ways seems quite old, she still seems like a bit of a tiddler but is slowly fattening up. I have to say, I thought having a second child would be a total breeze and just fit straight into our lives without batting an eyelid. Seb had been such an easy baby that he totally lured us in to a second, a testament to him I think. However, I have to admit, going from no kids to one was a doddle compared to going from one to two. Those first 6-8 weeks were a total car crash of trying to find a routine as a three (as Will got the luxury of heading back to work) with Seb getting fed up of the endless feeding sessions and lack of attention. But we got there… just! With this newfound rhythm in our day-to-day lives and a more organized routine, I’ve had time to get back in the kitchen and bake / make a few things recently which I’ve loved. I made some spirulina cocoa protein balls, blueberry and pistachio cheesecake and most recently, these ‘Maca-Seed-Choc-Squares’. 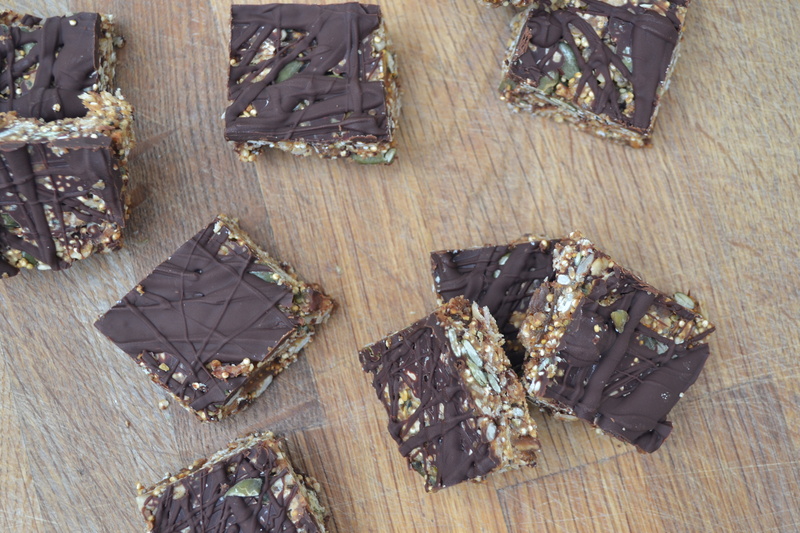 I often fancy a post-lunch, early afternoon pick me up and these often come nut-based. 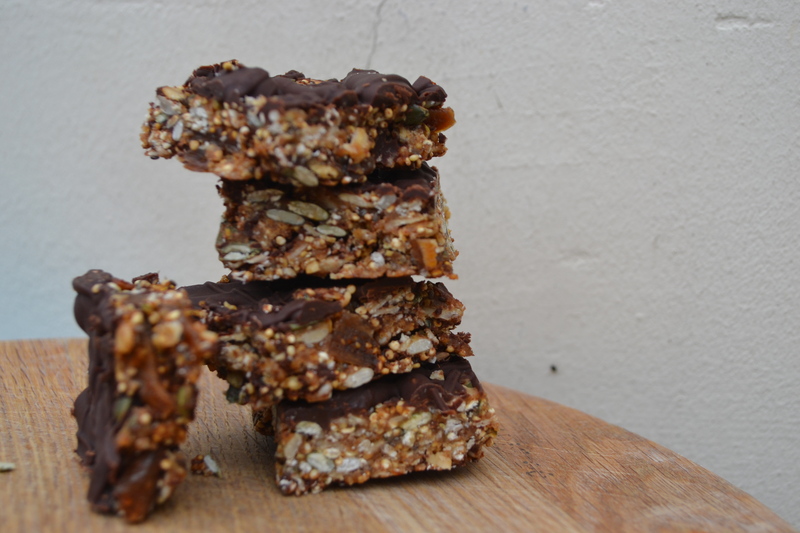 So I wanted to create something that still fills that hole in your tummy and satisfies that sweet craving, but without the usual nuts or dates. These little bites hit the spot delivering texture from the toasted quinoa, fats from the seeds and plenty of protein from the chai seeds. The dried figs provide a little chew which is a welcome change to dates that seem to be on every ingredient list at the moment. And let’s not forget the goodness you get from the super-power that is Maca powder which supplies you with natural energy and also works as a great immune booster. The chocolate could be left off but I think it compliments the flavours of the seeds and dark chocolate like this is great for you anyway. 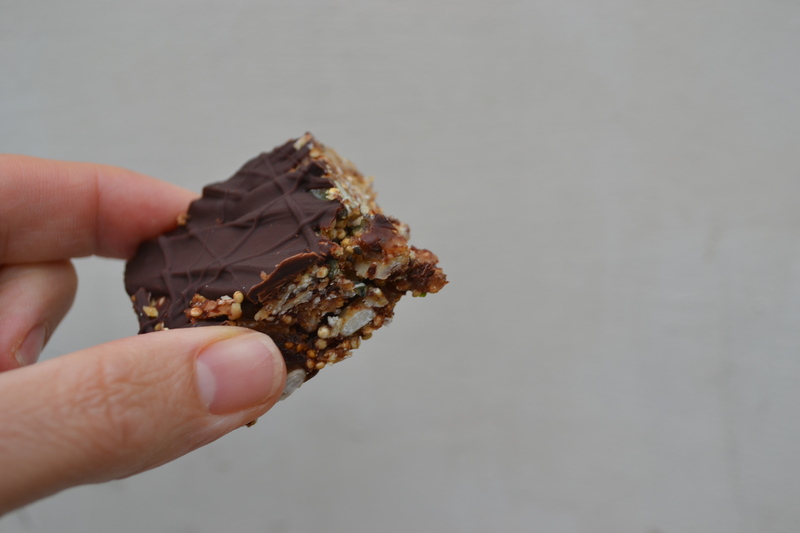 It’s not like you’re eating a whole bar… unless of course you devour all these bites in one sitting which to be honest does require some serious will power to not do! They take no time to make, definitely can be whipped up in a lunchtime nap so there’s really no excuse not to give them a try. I’ll be taste testing these on Seb later for his post-nursery snack. Fingers crossed it will get signed off by the little man too. Line a couple of baking trays with baking paper and toast your oats, quinoa, pumpkin seeds, sunflower seeds and hemp seeds for 10 minutes. In a saucepan melt your coconut oil, sunflower butter, vanilla bean paste, rice syrup, maca, cinnamon and sea salt. Put your toasted ingredients into a bowl, add your chai seeds and chopped figs and pour over your melted nut butter. Mix together thoroughly. Line a brownie tin with baking paper and press in your mixture to form an even layer. Place in the freezer to firm up. 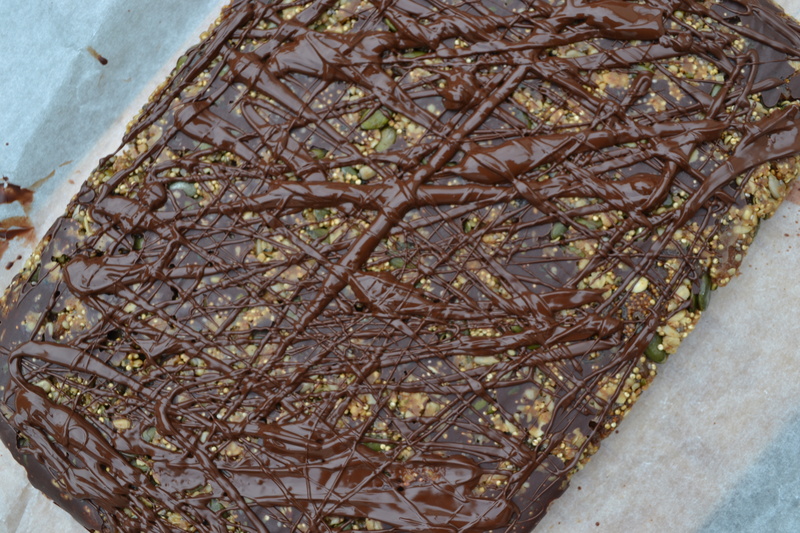 Whilst the seeded bar is firming up, melt your chocolate in a microwave. It should only take a couple of minutes. Once melted you can stir through your tsp of baobab. Make sure it’s thoroughly mixed in. Take your brownie tin out the freezer and drizzle over the chocolate before placing back in the freezer to firm up. After about 30 minutes, you can take it out the freezer and cut into bite size squares or bars if you prefer. You can store them in the freezer and they’ll last up to a month, although very unlikely as soon as you taste one. 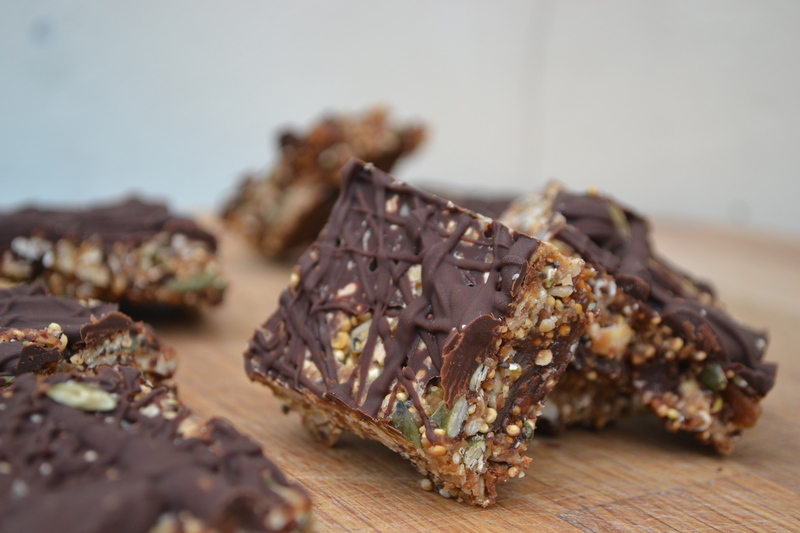 This entry was posted in Baking, Biscuits and Cookies, Desserts, Recipes, Snacks and tagged Chai seeds, coconut oil, Dark chocolate, Figs, Hemp seeds, Maca, Oats, Pumpkin Seeds, quinoa, Sunflower Seeds. Bookmark the permalink. It really is! and far too easy to consume at all times of the day!